Nomenclator Botanicus 2 (1841) 289. Lamina 15-80x6-20 mm, variable from simple (lanceolate to ovate) to irregularly pinnately or bipinnately incised. Pinnae 8-30 mm long. Glabrous to sparsely hirsute with appressed hairs, margins ciliate. Petiole 15-45 cm, erect. 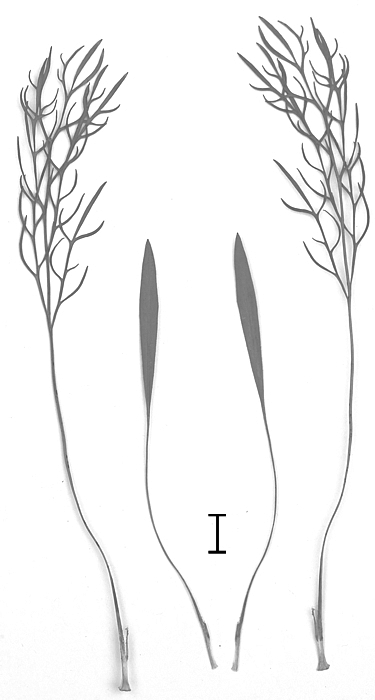 Stipules subulate, adnate to petioles for half their length. Branched scape, with 2-4 pseudo umbels, each with 2-9 flowers. Peduncle 2-8 cm, hirsute with appressed curly hairs and interspersed with long glandular hairs or only glandular hairs, pedicel ~0.5 mm. 5, lanceolate, posterior erect, usually triangular, other recurved, lanceolate, green to reddish brown. Hypanthium 6-12 mm. 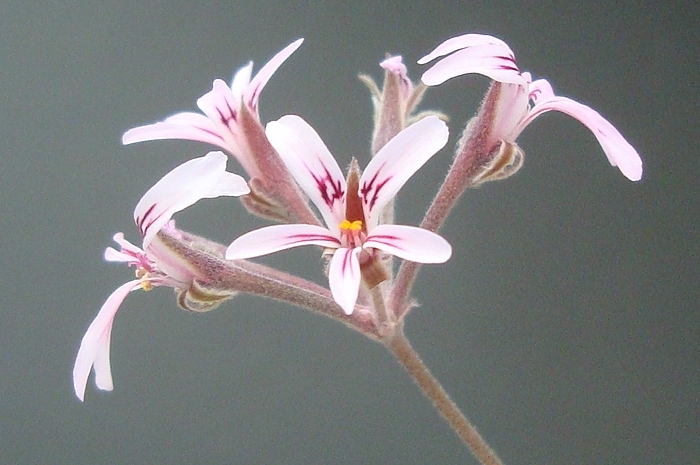 Petals white, cream, pink, posterior ligulate with rounded apices, with feather-like markings, occasionally prominent blotches, 8.5-15x2-4.5 mm, anterior spathulate, slightly narrower. 5 fertile, 2.5-5 mm, posterior one 2-4 mm. P. proliferum belongs to the group of hoareas with highly variable leaf shapes, which is reflected in the large number of synonims. 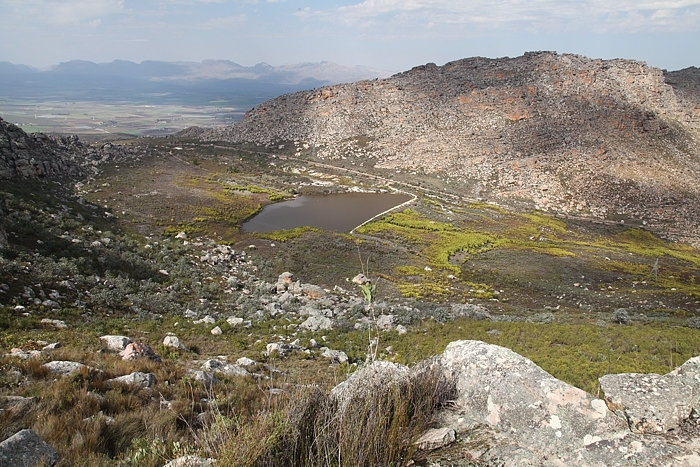 It also occupies a range of different habitats, it likes mountain slopes as well as flats - here in the valley along the road from Middelberg Pass in the Cederberg mountains (where it is also frequent) towards Ceres, about 20 km from the top of the Pass. 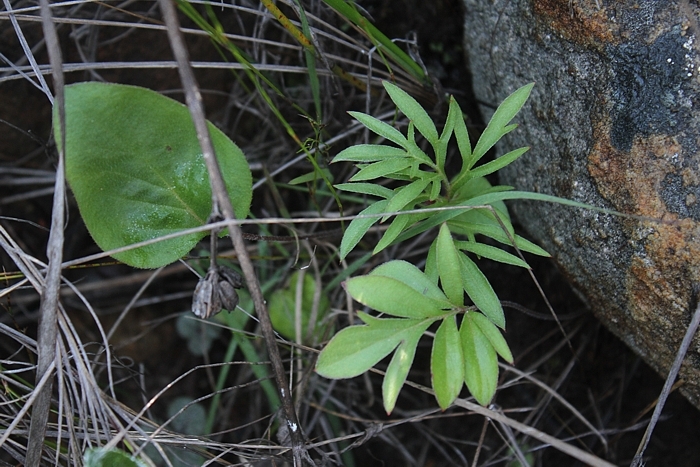 The petals of P. proliferum can sometimes be quite big, with prominent blotches, and given the similarities with P. longifolium, particulary in relation to the variability of leaves, the two species can be confused. However, the length of petals in P. proliferum is <15 mm, and in P. longifolium, it is >14 mm and in addition, the petals are undulate. Not a very good photograph, but a good example of an extreme case of phyllomorphosis: first leaves of the growing season are entire, while later leaves are bipinnately incised with very narrow pinnae. Impossible to find among the grass-like plants. Another beautiful fynbos habitat in the Slanghoek valley close to Worcester, at the foot of the Slanghoek mountains with the infamous Bainskloof on the other side. P. proliferum is in a very good company of the ubiquitous restios and very chic bluebell gladioli. prolificum (Eckl. & Zeyh.) Steud.